Silly or cute a three year olds defination. From a haircut to the Hands on Childrens Museum a child explores. She sees something I should see she says “That’s Silly.” I in-turn see something she should see I say “That’s Cool.” So I ask her when she says that sometimes it is silly, but sometimes it is cool what you want me to see? She looks and ponders, the car goes along we pass something she likes wants me to see, “That’s Cool” I agree it was cool colorful, creative, unusual which is what I mean by cool. 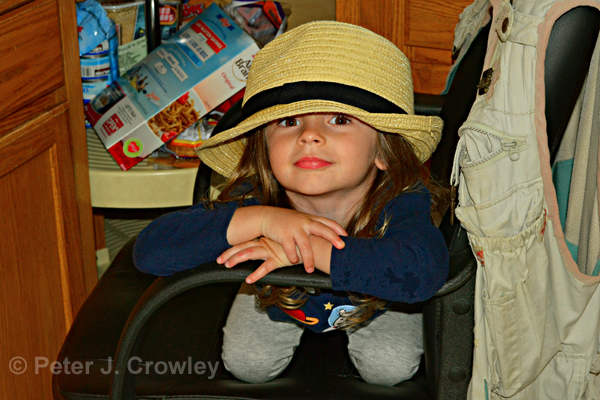 Later we pass something else from the back she hoots “That’s silly!” It was and grandpa smiles. Next month 4Y.O. time races by faster than a speeding 3 YO and that’s fast. Here are a few moments from recently for me but long ago for her. There is little time to linger as there is something new, something always comes next. 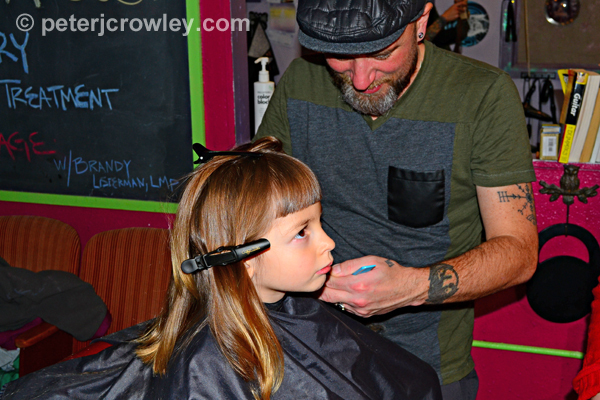 The first real haircut with Jason at Jamie Lee and Company. She sat very still and the bangs are not in here eyes. We played with the kitties, looked at the art and laughed while mom had her hair cut. 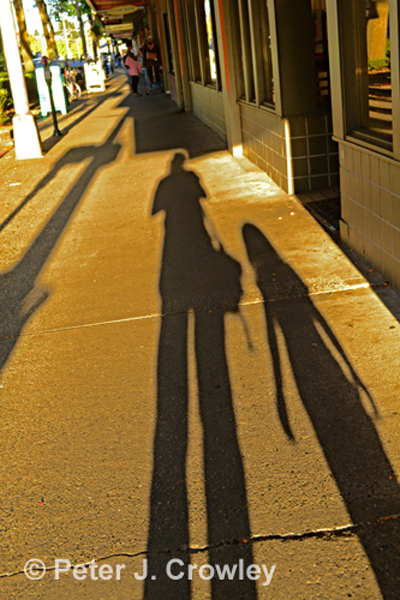 In September we were meeting mom downtown she noticed the shadows and I talked about how at the end of the day shadows grew fast. Standing for a few minutes we watched them increase in length. Take a picture grandpa. It was cool. Boo Bash at The Hands On Children’s Museum where she was a Penguin. We sat for a picture in a giant chair now that’s silly. 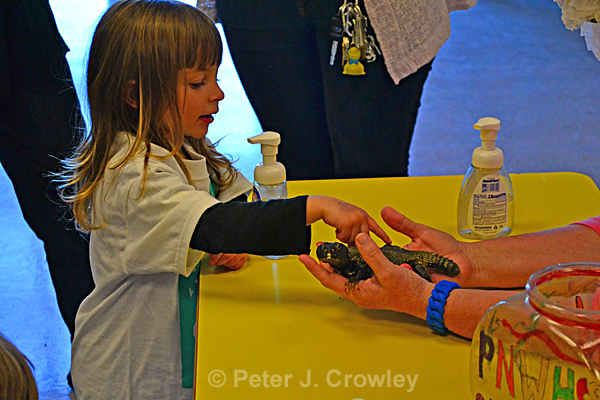 There were snakes and lizards to pet and a real Herpetologist to meet. Turtles, a Hissing Madagascan Cockroach, a glow in the dark tee shirt to make. Something always comes next, Grandpa grandpa she squeals above the din of 300 + kids racing from event to event so much to see and do. To touch she wants to touch everything it is a way of understanding the world around tactile communication. The movies she watches, the books she reads Mostly Nat Geo or Nova. Science videos, documentaries it is plain that people are a boring animal. Ahwooo she howls I am Trancern the king of the wolves. I have two young granddaughters. So glad they save me from seeing the world only from my perspective. Their perspective is way more Silly Cool! 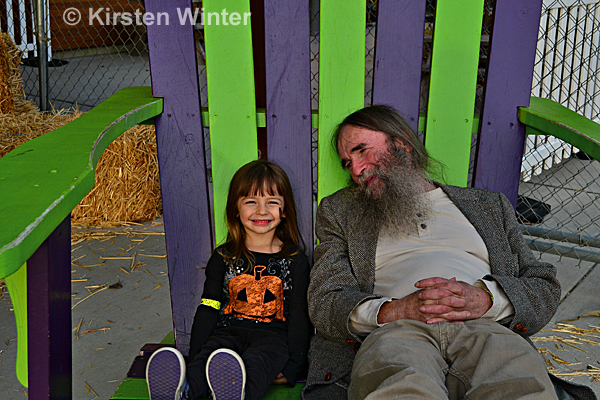 Thanks, Peter, for sharing your witty and wise granddaughter with us. Merry Christmas, Peter, to you and your family. Your granddaughter our beautiful. Love the hat. Oh, Peter. Your granddaughter is so delightful! How precious are these memories made even better since you are able to capture some of these moments on film. I especially love the shadows! Merry Christmas to you and your wonderful family, Peter. We miss you here in Connecticut. But so happy for you that you’re there and able to spend these special moments with your beautiful granddaughter. Jut found your comment, it is wonderful to be 3 again we had a Christmas Eve Sleepover. She loves it when I stay over mommy reads us stories then she takes me to my room with a stuffed animal to cuddle with. It is very special. LOVE! The shadow shot is so perfect…just like that little one…Growing so fast! I am glad you are all together!